Download The Brittany Serif font for free. The Brittany Serif is a font / typeface offered for free. please note that if the license offered here is non-commercial you have to obtain a commercial use license / permit from the original author. 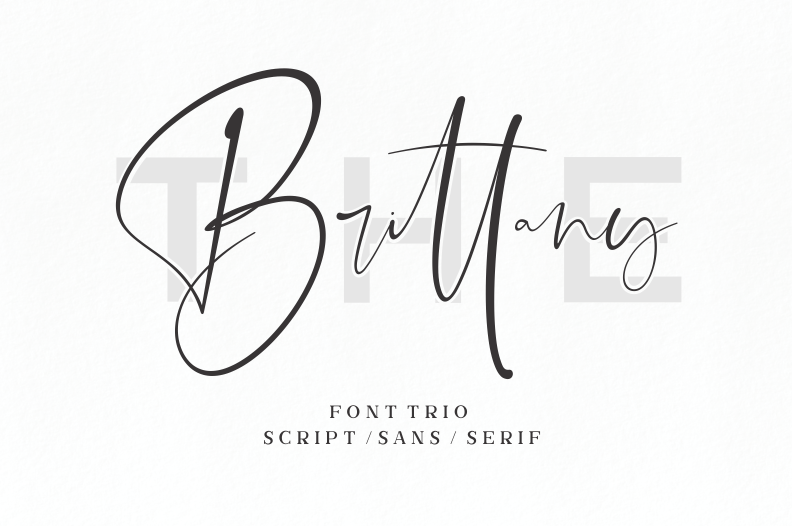 The Brittany is an elegant font trio. It comes with 5 styles which can be paired together perfectly! It gives you the opportunity to create stylish and modern designs, every time you use it. Thr Brittany comes with Brittany script that contain 81 ligatures , lowercase & ligatures swashes, Brittany sans ( Regular, Bold), and Brittany serif 1 & 2. The Brittany is the great choice for watermark on photography, signature or signature logo design, quotes, album cover, business card, and many other design project. If the The Brittany Serif font is offered under 'commercial use free' or 'creative common' license, feel free to use The Brittany Serif font for any purpose.